Mystery and Intrigue! The triangle denotes the shape of the pyramids – which are found the world over. The GF2606 – Yellow Gold Filled – 15mm 24 gauge Triangle Blank (no holes). These are Equilateral Triangles – three equal sides containing 60 degree angles. 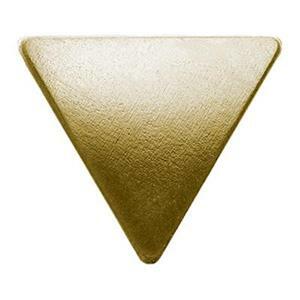 Unleash the secrets to your own enigmatic jewelry designs with these gold filled triangle blanks. Solve your own mystery as to why these are a popular best seller.